Children with autism often have food aversions. Some individuals might insist on eating only foods with a smooth texture, for example, or they may refuse green foods. This can escalate behavior issues which can complicate matters at mealtimes. It is possible for a child to overcome these behavioral challenges and learn to eat a variety of foods, with the help of a behavior analyst. 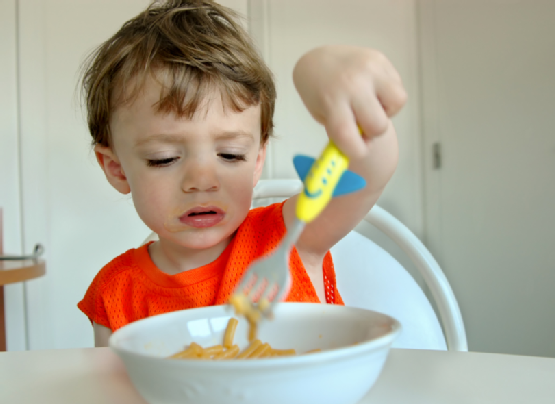 Every parent of a very picky eater knows the frustration that mealtime can cause. Unfortunately, food aversions may also create nutritional deficiencies, which can affect the overall health of your child. Researchers have found that children with autism are much more likely to eat a diet that has inadequate amounts of calcium and protein . They have also noted that these food issues may possibly contribute to social skill deficits and delayed academic achievements. Although food aversions can be frustrating, it’s important to maintain a positive attitude toward trying new food. Avoid trying to force your child to try a new food. Instead, use creativity and introduce a new food gradually. Make a log of what your child will eat and another list of what you would LIKE them to eat. How can you begin with the foods they currently eat and gradually move towards the foods you would LIKE for them to eat? If they eat crackers alone and cheese alone and you want them to eventually eat a sandwich, your first step could be getting them to eat the cheese on a cracker. The second step could be the cheese in between 2 crackers, like a sandwich. You could then work on eating a tiny bite of bread. Then bread with cheese and finally cheese between 2 pieces of bread. If you take small, well planned steps, you can minimize refusal and increase the amount and type of food your child will eat, using positive reinforcement along the way. Children like to be in control of their own choices. You can encourage your child to eat a more varied diet by presenting choices and allowing him or her to make a selection. For example, place dishes with three different vegetables on the table and have your child make selections. This gives your child greater control within acceptable parameters. Do you struggle to convince your child to try new foods? At The Behavior Exchange , our autism experts can help children increase the foods they will eat. Schedule a consultation today by calling our Dallas facility at (972) 312-8733.